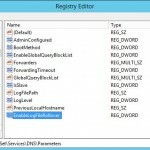 This entry was posted in Uncategorized and tagged cmdlet, CurrentControlSet, DHCP, DNS, DNS-Server_Service, EnableLogFileRollover, Event 2204, Event 3152, HKEY_LOCAL_MACHINE, PowerShell, Regedit, registry, Registry Editor, Remote. Bookmark the permalink. Your method of telling the whole thing in this article is actually fastidious, every one be able to without difficulty understand it, Thanks a lot. I will take a look and see if I can reproduce. Thanks for letting me know! came up, it appear to be great. I have bookmarked it inside my google bookmarks. on. Lots of other people will likely be benefited from the writing. basis, this web site is really pleasant and the visitors are in fact sharing nice thoughts. I had been suggested this internet site through my cousin. I’m now not certain whether or not this put up is written by using him as no person else recognise such detailed approximately my trouble.